Vice President Charles Curtis is the only person of known Native descent to ever serve in the Executive Branch. Not only could he trace his ancestry to Kanza Chief White Plume, he also spent his early years on the Kaw reservation. He was born Jan. 25, 1860, to Ellen Pappan Curtis, who was Kanza, Osage and Potawatomi, and Capt. Oren Curtis. His mother was part of the family that operated the ferry over the Kansas River, starting more than a decade before Topeka’s founding in 1854. The Curtis family lived on the north side of the river in the community then known as Eugene. Ellen Curtis died when Charles was a toddler, and his father put him in the care of his maternal grandmother on the reservation. It was there he learned to ride, and that skill made him one of the best jockeys in the region. And in those days, private horse races were common – a planter feature that divides the lanes on 8thStreet between Buchanan and Clay is an homage to the track associated with the governor’s mansion on the corner at Buchanan. He had a cab business, ferrying Topeka businessmen around by horse and buggy. Many lawyers were among his clientele, and one of the most prominent local lawyers, A.H. “Hib” Case, took young Curtis under his wing. Curtis clerked in Case’s office as he read the law, and he was admitted to the Kansas bar in 1881. Politics began to call, and Curtis put himself forward as a candidate for county prosecutor in 1884. It took three ballots for him to secure the local Republican Party’s nomination, and he was successful in his maiden race. He served two terms in this position. In 1892, Curtis was the Republican nominee for the U.S. House of Representatives. After winning election, he spent eight terms there, serving on the powerful Ways and Means Committee. In 1907, he was appointed to fill the remainder of the term of a senator forced to resign in a bribery scandal. 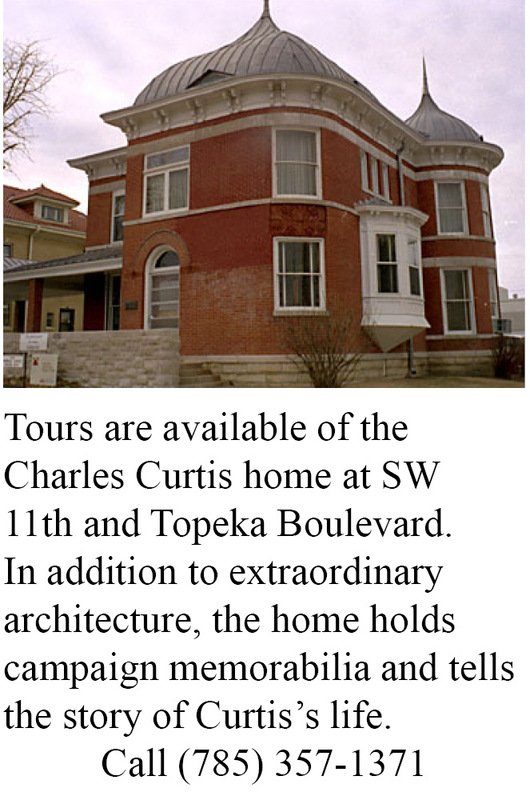 Curtis kept that seat, being reappointed by the Kansas Legislature. When that term was up, though, the law had changed and senators were being elected by a direct vote of the people. The 1912 election saw a sweep by the Democrats, and Curtis had to sit it out for two years. Re-elected to the Senate in 1914, he went on to serve another 14 years in the Senate, the last three as majority leader. He served on committees related to Indian affairs, but critics say he led efforts to weaken tribal rights. Curtis sought the Republican nomination for president in 1928 but was beaten out by Herbert Hoover and ended up as Hoover’s running mate. They lost their re-election bid in 1932 to Franklin D. Roosevelt. Curtis died Feb. 8, 1936, and is buried with his wife, Annie Baird, on the southeast corner of Section 80. They wed in 1884 and had three children, Permelia Jeannette Curtis, who was married to Brig. Gen. Charles P. George and is buried in San Antonio; Harry King Curtis, whose wife was Beatrice Elliot and is buried in Tampa, Fla.; and Leona Virginia Knight, married to Webster Knight II and buried in Providence, R.I.
A donation drive in the 1990s provided the funds to add a monument with vice presidential seal and a flagpole to the burial site.